loves making art about art. The full-room game installation visualizes the data collected by engineer Frederic Cloth from the corpus of Kota reliquary figures (guardian statues from what we now know as central Gabon and the Republic of Congo). The goal was to make data visualization enjoyable and educational, providing a unique “closer-looking” exercise to encourage visitors to engage in thoughtful, open-ended play. The installation is a full-room experience, designed to communicate the breadth of the corpus of artworks. The thousands of cards on the walls, slowly rotating around the players, represent the data points of the corpus of known Kota figures, while the 50 cards on the interactive table represent the figures on display in the exhibition. When the player brings two cards on the table within proximity, those cards link to each other. The color, thickness, and length of the link indicate the relative closeness of each figure within the data cloud. When a player links a group of cards on the table, a line is drawn through the room from the connecting data points in the cloud, creating an ever-intensifying lightning storm of connections. 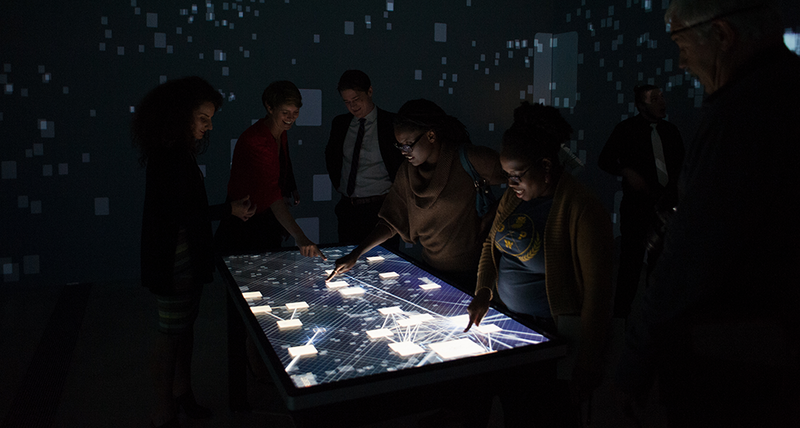 The Kota Data Cloud project culminated in a 6-month artist residency program during the exhibition, where my team and I designed and developed experimental interactive works inspired by the Kota Data Cloud. The primary project was an interactive web app that allowed visitors to explore the catalogued attributes of the artworks by creating their own theoretical models. These Kota-inspired models were then generated as 3D printed objects, and were used in a month-long student-led curatorial workshop in the residency space. Additionally, in collaboration with musician Philip Hayes, we converted Cloth’s XML data set into a procedural music library and designed a museum-wide digital concert of data-driven songs, utilizing the data from the 50 figures on display in the museum. Ultimately, I feel that this project encapsulates the power of interactivity on a cultural level. The installation brought about deep discussion about the use of free-form play as a way to better see nuance in artworks, and about the ethics of using modern technology to interact with spiritual objects. The unique approach to experiencing the artworks attracted a new audience to the institution, and allowed visitors to experience and think about the work in completely new ways.